After the first meeting with Rob at Waterstones, I immediately started a sketchbook of alternative interpretations for our word: Wave. We had decided to avoid the obvious rolling wave definition because another partnership had u for undulation and we soon realised that there were very many other alternatives. Our brainstorm came up with: waves of emotion, nostalgia and nausea, waves of starlings and there are sound waves, heat waves and microwaves. Wave can mean opposites: wave hello or wave goodbye and Stevie Smith’s ‘Not waving but drowning’ when a man’s thrashing was mistaken for waving. The wave of a hand originally meant unarmed respect, it’s now used if you want to wave a taxi down! Developing these ideas was filling my sketchbook nicely; opposites attracted me most: waving hello/goodbye and open and close quotation marks. A busy time for me: in between open studios, exhibitions, book covers and other commissions I only had a little time to develop some of my sketchbook ideas. Rob suggested writing a song using found lyrics and I had a bit of fun developing some Mariscal-style lettering for the words ‘Hello Goodbye’ and also a positive/negative idea using silhouettes of hands. I also experimented with ‘writhe in waves’ with positive and negative waves running through the lettering. 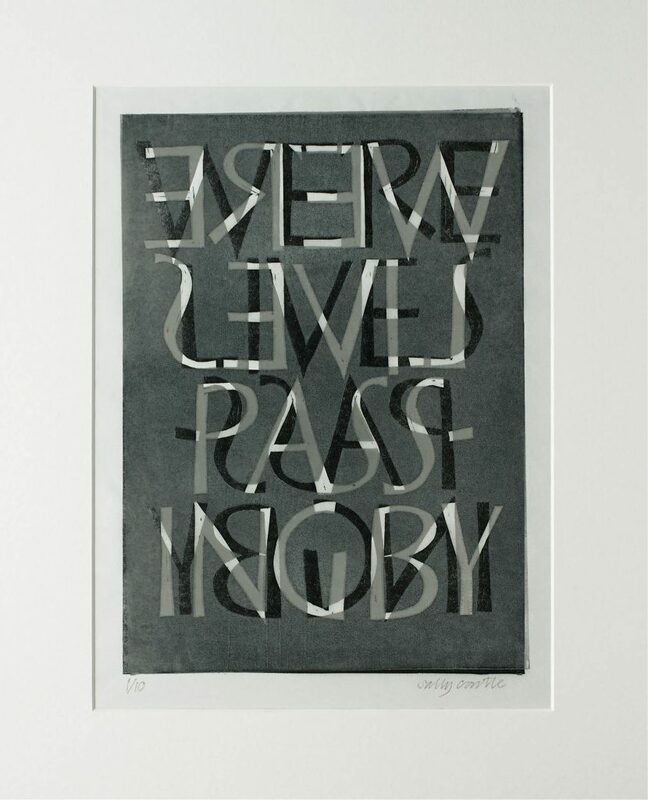 Developed lettering for ‘We’re lives passing by’ and made a lino cut, with the first two words cut in reverse and the remaining words not reversed. This was interesting to cut because I am used to cutting lettering in reverse for relief printing but there I was cutting letters ‘the right way round’! Experimenting with different papers I found that printing on both sides of Tosa Washi Japanese paper gave the effect that I was aiming for. Tried blue and green and also black and grey combinations, also printing black and blue on brown wrapping paper gave an interesting effect but the results were rather unpredictable monoprints making it not suitable for an edition of ten prints. Printing on both sides of the semi transparent paper gave some unforeseen results where the letters touch or almost meet to make circles or not quite circles; seemingly appropriate for the wording. Rob and I did not meet again after our first meeting but emails batted to and fro and the whole thing has been a great experience! Sally, hello. Quick. Must dash. Coffee soon? Absolutely, let’s. I’m Reading, I’m London. London then. Piccadilly, next week. Deal. Sally, goodbye. Ideas. Wave. Waaaaaave. Wave? Sea, no. Wavy line, no (undulation another’s word). Emotion, maybe. Starlings in formation, creative. Sound wave? Greeting. Hello, goodbye. Hello, Sally. Sketchpads out. Fruit tea. Wave’s hello and goodbye. Explaining my thinking. My listening. You say yes. I say Beatles. Lyrics. Lyrical poetry. Greece. Long, short, long, short. No stress. Too stressful so I say no. Think to Nick’s found poetry. I say stop. But found lyrics? Go, go, go. Go emotions, go sounds, hello goodbye. Alive with ideas. Alive with voices. Word choices. My stories in others’ words. Goodbye, Rob. Hello, words. Sally? I like. Great. I’m off to Barcelona. Quiet café. Streets alive with hola and como estas. Pintxo people picking at plates. I write. Listen. Hear. See. Barri Gotic inspires a tired mind. Cuban beauty Heydi says hi. I say hello. First stop favourites. ‘Hello goodbye’, ‘My Loose Tongue’, James’s ‘Sometimes’. Classics, Radio 2, Brian Matthews, Gerry and the Pacemakers. 6 Music, Cerys, Laura Mvula. Listen, hear, smile. Found lyrics. Found angle. Foundwave. Chop up, piece together. But what’s the story? Lovers entwined, pass me by. Morrissey. Commentary. (All those) people, all those lives (where are they now?). Lovers in my life. Past, present, future. Our story, our lives, others’ words. One. A girl. 26. A love, a lover. Lives passing by, entwined in others’ times. Both of us. When I look deep in your eyes, I see those dreams are what you love. Sally’s favourite line. Inspired by words and stories of my times. A style emerges. Bold, angular, Catalan. Childlike in its confidence. Like a child, says Mum. I like, she says. Mariscal, says Sally. A flirt of lettering. Work in progress. Holiday, break. Lagos away. Busy, both. Stalling, a little. No time to talk. Just time to take it further. Singer to sing the song. Who? KB, of course. Quiet girl, quietroom. Classically trained. And Big Bear to share big bass sounds. Jam, beer. Chords. Chorus. Key of B means lots of flats in our flat. Sharp education in how to nearly write a song. But not. Beer at Betsy that week and what’s your word? Mike, Martin, others. What’s your approach? Wave. We’re writing a song. Lyrics. Other people’s, edited. Found. Pieced together to reflect moments in my life. Linocut and written in waves. Writhing in waves. Colours now, Sally says. A black and white. A subtle green. Simple design. Keep it clean. Allow the words to wander past each other. Lives passing by. Two waves overlapping on a virgin beach. And the music? KB, are you inda house? Lilting, jazzy, perhaps too good. Too beautiful for this life. We’re knocking off the edges. We’re refining as I type. We’re finding the right sound for a piece of art that wants to speak in every way it can.